Born on the Canadian west coast I feel most at home when I am near the ocean. Having found my art passion early in life I received my Bachelor of Fine Arts, graduating in 1981. 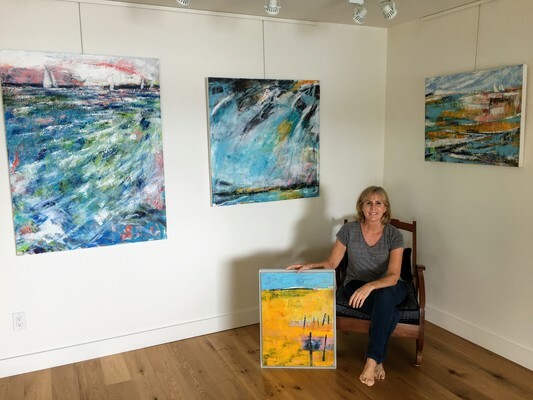 It wasn’t until 2010, after years of living abroad and raising our two kids, that I returned to painting full time and I haven’t looked back since. My studio looks out to sea where my husband and I sail our boat, Take Five. This is where I get my inspiration. Boats and rigging, flags and buoys, sailboats, islands and docks make up my world. I paint these icons of the westcoast in my playful and vibrant semi-abstract style. Travelling has also played a huge part in shaping my perceptions. I have lived in Malaysia, Singapore, Texas, Newfoundland, Alberta; all have their own unique influence on my art. Oil and cold wax or acrylic on canvas are my preferred mediums. My tools vary with scrapers, squeegees, feathers and chopsticks as I love to experiment.